I think every child should study maths, English, history or geography, a language and the sciences up until the age of 16 – Not because I think these subjects are the only ones that matter – I can see the masses poised behind their keyboards waiting to be outraged by the mere suggestion I might believe this to be the case…because these subjects are the academic core, the foundations of a good education that ultimately will keep options open for young people’s future. I mean, why should I be outraged? What could possibly have outraged me? I want my daughter to have a good academic education… I have nothing to be outraged about. If you didn’t know what you wanted to do… then the arts and the humanities were what you chose because they were useful, we were told, for all kinds of jobs… We now know that this couldn’t be further from the truth. That the subjects to keep young people’s options open are STEM subjects – science, technology, engineering and maths… Because the skills gained from studying these subjects will come in useful in almost any job you care to mention; from the creative and beauty industries to architecture. The intended message might not be that STEM subjects are the only ones that matter but, the more you hear this kind of rhetoric from the Secretary of State the impression might be made that she believes that science, technology, engineering and maths are the most important subjects. Hang on, isn’t there a problem here? Let us look at these two statements, the one from her Policy Exchange speech and the other from last year at the launch of a campaign called ‘Your Life’. In the first one Morgan defends the Ebacc in the second she waxes lyrical about the importance of STEM. Only Science and Maths feature in both, ‘Technology’ and Engineering, among others, do not. If the subjects to keep a child’s options open are STEM then, surely, STEM should feature in the Ebacc? Computer science features which might ‘suffice’ as a technology option but only at the possible expense of another science. 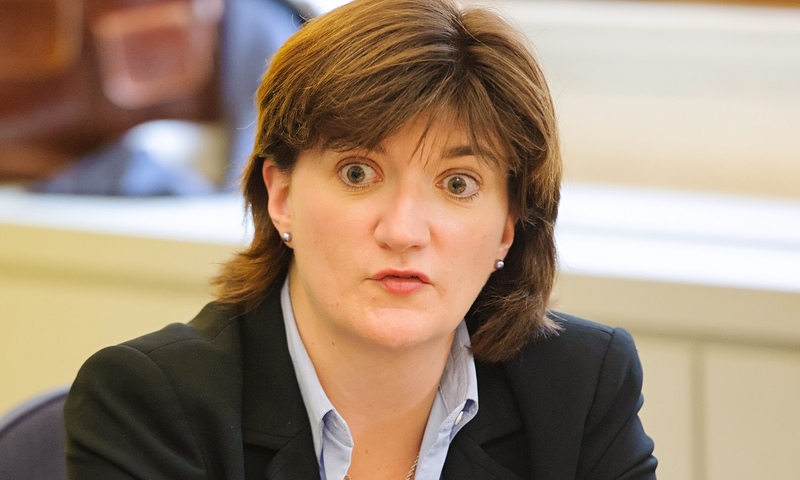 This means that the Ebacc trumpeted earlier this week as: “the foundations of a good education that ultimately will keep options open for young people’s future.” has been shown up by the same Nicky Morgan not to be. This Morgan says that “the foundations of a good education that ultimately will keep options open for young people’s future,” include technology and engineering and not the humanities. By implication Morgan believes that the humanities being useful for the job market ‘couldn’t be further from the truth’ and therefore the inclusion of history as part of the Ebacc as ‘the foundations of a good education that ultimately will keep options open for young people’s future… couldn’t be further from the truth.’ (And as for Geography, well I’m reliably informed that it might be a science anyway…) With recent reports stating that entries for Design and Technology GCSE are down by 29% are our young people able to keep their options open or not? This is an outrage!!! What is the Ebacc for? It expands children’s options in one breath and in the next breath it limits children’s options. This mess is due to the possible intention of ‘engineering’ for darker purposes than the means towards the pursuit of wisdom. If you want the foundations of a good education to be carved in the stone of an Ebacc then you would start from the premise of breadth, as a good education includes a wide range of pursuits, it includes sport, technology, engineering, voluntary work, the arts, the humanities. You would not start with the view of what an academic education from the starting point of the Government’s rather limited little list. With the intention of getting 90% of pupils to take the Ebacc what damage to young people’s futures might occur? As the Ebacc clearly doesn’t include all the subjects that Morgan believes: ‘keep options open for young people’s future’ I think it is about time what constitutes the Ebacc is put under review. An excellent expostion of some of the issues surrounding ebacc, thank you. She is no more interested in ensuring that every child achieves their potential than I am in reflecting on whether Stalin’s weaknesses outweighed his strengths.